1) The aggression and anger are manifesting only in my presence, now. This means that this portion of PTSD symptoms are under control, and this is purely a learned behaviour that can be addressed. 2) Propranolol treats PTSD symptoms. It keeps your adrenaline from increasing, thus preventing the acceleration of heartrate and preventing “flight or fight” panic attacks. The doctors who told me there was nothing to be done for my brain chemistry besides antianxiety and antidepressant medications were mistaken. I don’t have to dope up to tamp down my responses. 3) Skip the 123 Magic for aggression and violence from the children. Institute a daily and weekly reward system, and take away belongings when violence has been the chosen method of communication. Make them earn it back. 4) I need EMDR, as much as my child does, so my traumatic memories stop being traumatic and merely become memories, which will also help the stress chemicals in my brain. A world without triggers. What would that be like? When I finally stopped beating my head against the wall in hindsight over my own stupidity for inadvertently showing tolerance for inappropriate behaviour, I got to work. My son has lost every single one of his Pokemon cards. He can have back five each day that is violence free. I am waiting for one of those days to happen. He is already doing better, but his impulses are not in alignment yet, though I can see him trying. Battered women often do not respond appropriately to violence. There should be a zero tolerance, but many like me end up negotiating it in degrees of pain or intensity or intent, even. Being accustomed to it often means that incidents are not responded to with the correct degree of shock. I usually go monotone and place a child in time out with a lack of facial expression. This might have helped me to avoid further beatings from a batterer, but it does not teach a child the severity of their bad choices regarding violent solutions. Guilt will not help me, now I know better, and I can try to correct my behaviour and to help with my child’s learning. In an institutional setting, violent children have their every belonging confiscated, leaving them with a bare mattress. Their things are earned back, by demonstrating proper choices and behaviour. I cannot quite do this, as I have other children who play with things, too, but I sure can start with the most beloved items. The next things to be taken away will be anything else he wants to sleep with, as that is the surest way to estimate their value to him. Yes, he slept with his Pokemon cards. Every night, in a plastic ziplock bag. I also take anything used in a tantrum or violent episode. Throwing your Wii remote? No Wii. Throwing pillows at me? Don’t plead pillow fight when you are screaming insults in my direction, your pillow is gone. The EMDR provider for adults is over a half hour away from me. I will call tomorrow to find out if they can take a new patient and accept my insurance. This is the same organization that provides restorative parenting classes, so it is good I get in touch with them, anyway. Then I am going to the community college and asking for an education and checking my finance options. For any person reading this, who is in an abusive relationship, just leave. I am out now for nearly two years, and look at how it still consumes me. Do it for your unborn children, if you are childless, and for your children, if you have them. It’s never too late. Kick the guilt to the curb. You deserve an unencumbered life. My son is a movie fan. He watches movies obsessively. Over and over, and will reenact scenes or experiment with concepts in those movies. He watches Home Alone, he lays traps out for thieves and directs his siblings on how to set up the traps and guard windows. Trigger strings and all. I am aware of this artistic and scientific experimental side of him, of all children. This is why, each winter, I sit the children down and explain winter and snow safety to them. One must wear their winter gear, one must walk slowly on ice, one must get into the car immediately in the parking lot, one must never touch anything outside with a wet body part. Especially the tongue. My oldest son decided to reenact a scene, on the flagpole, outside the building as I buckled his sister into her carseat. I turn to find him and his brother, not in the car as instructed, but across the parking lot. This is winter guidelines violation number one. He has his tongue attached to the flagpole, and this is winter guidelines violation number two. In real life, it is not like a movie scene. It is not sterile, nor funny. The blood is profuse and cascades out of your child’s mouth. It is alarming, panicky, and horrifying. I am a single mother with three kids. My hands are full on the way out to the car, but not with any sort of drink for myself. I am not a yuppie mother with a Keurig and an au pair to carry my gear. This is reality, and not a Facebook status update. I have nothing to pour over my son’s tongue to help him. It is six degrees below zero. There is not much help to be had, with a liquid, anyway, at that point of frozen. My son does not feel pain as other people do. He has sensory issues. So as his tongue is madly bleeding, and I am trying to get my spit over the spot where it is connected to the pole, he is not feeling enough pain to stop pulling away from the pole. 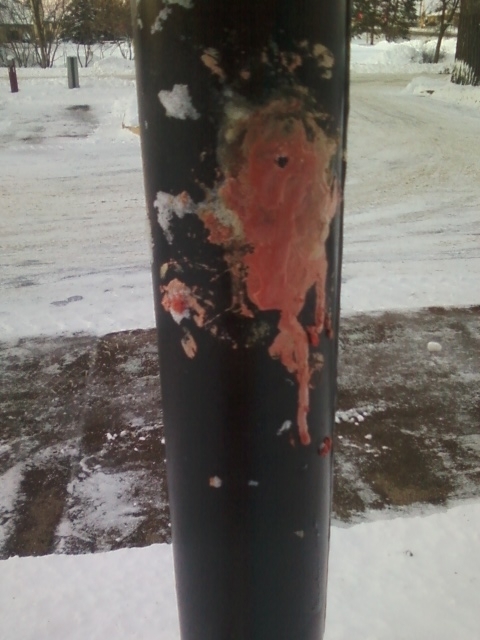 Like an animal, he rips his tongue off the pole. A piece of his tongue is still there. I take him to the emergency room. The nurse tells me that this is the first she has seen, ever. Apparently, this happens all the time in the town I live in, but no one brings their child in to the Emergency Room for it. I guess the local families don’t worry about blood loss or deformed tongues as I do. I am a city girl, and it was apparent in the hospital that I was being humored. The doctor did see him, and he is going to be fine. Of course, while I was in the hospital with him, no one told me I was covered in blood, myself, from my face to my fingers. I did not even check. I cleaned up my son, after the nurse, until he was spotless. I took him to school, in front of all the children and teachers, with blood all over me. In the car as I was leaving, I saw the blood in the rearview. I looked vampiric. He did not eat that day. That night, he asked for ibuprofen and got it. The children got a nice, long, emotional lecture about what happens when you do not follow Mommy’s instructions, the visual accompanying it being the oldest of them and his ravaged tongue. 123 Magic could not keep my mouth shut that day. When the doctor handed me the aftercare sheet, I asked him if it contained a list of all movies with frozen metal/tongue scenes. He laughed at me. I was serious. Prevention is the cure. One of the directives from the psychologist are to make sure my active child gets plenty of exercise. Hard to do in zero degree weather. The closest indoor play area is a half hour drive away, if you do not count McDonalds. No one wants to count McDonalds. Each of the past two weekends I have driven the children to this indoor park and paid two hour’s wages so that they could run and climb and jump and scream for an hour. It helps, but I cannot do it every single weekend day. Everything I do is in triplicate, therefore usually cost prohibitive. On the days we go, my son finds good behaviour easier to dredge up from the depths of aggression and defiance. This weekend, and last, he was also good on the days that we did not go, being Sunday. Maybe the stress tabs are working. I stopped the caffeine. I did it for a week and did not see a benefit. A week is all I can withstand of a caffeinated hyperactive child. The daycare reports less physical aggression, but more verbal defiance. I will take it, and give thanks. I bought a Yoga video, again on the psychologist’s recommendation. I think I should stick to YouTube, because Yoga, after the first time or two, is boring for children. If I was living on the first floor, I would have them doing all sorts of floor gymnastics, and would not need any video at all. But alas. I am upstairs with a neighbor or two who complains about the thumps and bumps of small children with energy to burn. I have been viewing the coming cold with dread. The past few weeks give hope.